Who knows exactly how long the Mills Brothers have been singjng together, thrilling most of us with their smooth and gentle harmonies, it's been more than a quarter of a Century since they started and it's definitely a credit to their talent that they've been something of a synonym for American pop music since the beginning. The beginning... well, they're from in and around the Altoona, Pennsylvania area but that's not really the beginning. You see, the Mills Brothers were originally a couple of voices and a harmonica. That is until one night, early in their career, when the harmonica was lost. Gone, disappeared, not to be found. Well, if you know anything about fledgling musical groups, you know that gigs are hard to come by in the beginning and if you want to eat, you go on... no matter what. You go on if only one person of a three man group shows up, you go on if your guitar has a broken string, you go on if you don't feel well, you go on ... period... you just go on and you do your thing. The Mills Brothers went on, sans harmonica. They did their thing and a musical phenomenon was born. A phenomenon that has lasted more than twenty-five years and has, throughout much of the free world, become a musical signature for the United States. 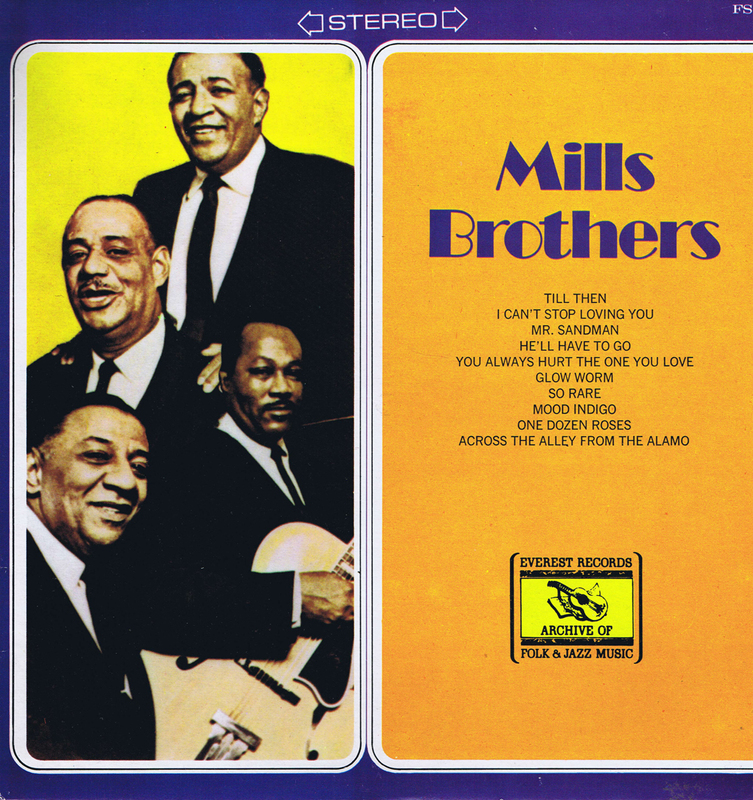 The Mills Brothers have been awarded gold records on three different occasions... for "You Always Hurt The One You Love" in 1944, for "Paper Doll" in 1948, and for "The Glow-Worm" in 1952. As a musical entity, the Mills Brothers have bridged several generations during their career. The Mills Brothers are back, come to think of it, they weren't really gone... but they're at the top again. I think it's nice to hear from them again and I think you'll feel the same way. With the current renaissance of folk and jazz music there has come a proliferation of recordings purporting to represent these sign posts of Americana. It is well nigh impossible to successfully manufacture those unselfconscious original sounds today. They were a product of the times and the people. Though many of these modern recordings are slick and pleasant they are neither jazz nor folk music as originally performed. Authentic performances of indigenous and unselfconscious music of the people by the "minstrels" of the peopie seldom have enjoyed the benefits of big-city recording studios and techniques. However, some of these were recorded, albeit under rather difficult conditions and on not so high-ti 78 r.p.m. discs during the thirties and forties. Most of them have been out of print for years and exist only as well worn 78's in the collections of a few buffs. It is the avowed purpose of the Archive of Folk & Jazz Music to seek out original recordings and to selectively and carefully make them available to the public as relatively high quality L. P.'s at reasonable prices. The illustrious names represented in this line have long been known and revered by dedicated folk & jazz buffs. Now these historic recordings may be enjoyed by the modern generation, most of whom were not even born when these historic slices of folk lore and heritage were performed. In order to transcribe these oft-times worn, poor quality 78 r.p.m. discs our engineers spend literally hundreds of hours tediously splicing, editing and adjusting. A microscope has to be used just to select the proper stylus tor playback. As many as 500 splices may be made in one recording to eliminate the "pops "and distortions without impairing the performance. In any case —the performance comes first and you will find yourself ignoring the distortions as you become enthralled with the sincerely and soul of the artists. The Archive of Folk & Jazz Music is proud to bring these recordings to you. It your reactions are favorable, we can continue the "good fight" and bring you more great performances — Good listening!